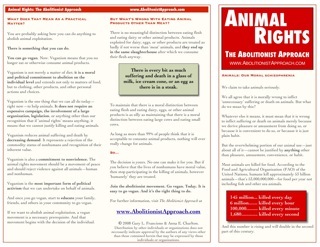 We now have available Spanish and Portuguese versions of our pamphlet on the fundamentals of the abolitionist approach to animal rights. Both versions are provided in U.S. Letter and A4 formats. Thanks to Dra. Ana María Aboglio for doing the Spanish translation and to Regina Rheda for doing the Portuguese translation. And ongoing thanks to Randy Sandberg and Barna Mink for their web design work. Please also remember that our video presentations, Theory of Animal Rights, Animals as Property, Animal Rights vs. Animal Welfare, and Animal Law, are all available in Spanish and Portuguese (as well as in French and German). Stay tuned. More translations are coming. And our podcast is about to be born…. During the past year, I have received more than a hundred requests to produce a pamphlet that presents the abolitionist approach in an accessible way. 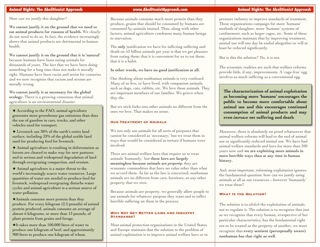 So, with production help from Barna Mink and Randy W. Sandberg, Anna Charlton and I created a Tri-Fold pamphlet that we offer to you to facilitate your efforts to educate your family, friends, and community about veganism in a nonviolent and creative way. You can download the pamphlet by clicking here. The pamphlet is presently available only in English. We will be providing French, German, Spanish, and Portuguese versions in the near future and we would like to provide it in even more languages later on. We hope that you find this pamphlet to be useful.